Emerald Coast’s new seed house, built by retrofitting and expanding an existing X.S. Smith greenhouse, puts all tools under one roof. Emerald Coast Growers, based in Pensacola, FL, recently added a seed house to increase production efficiency at its Florida operations. The new facility gives the company the efficiency of having everything together, according to Josiah Raymer, General Manager. “It increases our control over inventory, sowing rates, germination percentages, and our growing conditions,” Raymer says. The new seed house, built by retrofitting and expanding an existing X.S. Smith greenhouse, puts all tools under one roof. Some seeds benefit from a temperature-controlled germination room that allows them to germinate in moderate conditions when it would otherwise be too hot in a greenhouse. The new four-bay facility provides this, as well as an in-house seed tray filler and a cooler for stratification of seed trays for hard-to-germinate seeds and day length control. Each bay holds about 860 trays. Emerald Coast Growers added small touches to further enhance the efficiency, such as a table-based Netafim irrigation system with Vibromist watering heads. “It allows us to water our 5-foot tables accurately — important with small cell sizes,” Raymer says. In addition, the company installed a custom-built monorail through the seed building that connects all areas to the adjacent seed greenhouse, where seed trays are finished off before being sent out to ranges to be dibbled into trays. This allows the majority of the work to be carried out by a single grower. Flow is from one end of the seeding building, out into the greenhouse and out the other end of the greenhouse where trays are pulled for production, whether they’re transferred to another location or potted up on site. 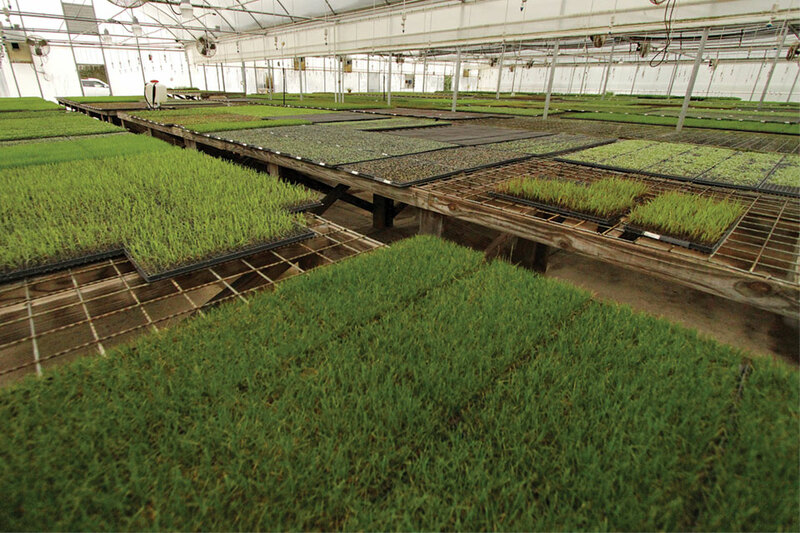 With the change, all seeding for the company’s three Florida locations is done in one facility, giving the company more control over greenhouse variables including lighting, watering needs, fertilizing, cut backs, scouting for pests, and disease management. Joli A. Hohenstein ([email protected]) is marketing and PR specialist for Pen & Petal, Inc., a marketing, advertising and public relations agency for the green industry who regularly produces turnkey catalogs of all sizes for clients across the globe. See all author stories here.